Main objective of this report is to analysis Remittance management system of sonali bank limited. Other objectives are the consumer banking services and operating system and evaluate the factors affecting performance of the bank also suggest the better ways of enhancing the performance of the bank. Here analyze the financing systems of the bank to find out any contributing field and explain the profitability and productivity of the bank. Finally find out the challenges associated with the activities concerned with remittance department. To gain practical knowledge by working in different desks of Corporate Branch of Sonali Bank limited. To review the consumer banking services and operating system of Sonali Bank Ltd.
To have a revelation on the banking environment of Bangladesh. To evaluate the factors affecting performance of the bank. To suggest the better ways of enhancing the performance of the bank. To acquire knowledge about the every day banking operation of Sonali Bank. To make myself more confident and active in future to finger my job. To analyze the financing systems of the bank to find out any contributing field. To examine the profitability and productivity of the bank. To get an overall idea of banking from banker’s point of view. To review the techniques used by the bank to make it lucrative. To describe the organizational structure, management, background, functions and objectives of the bank and its contribution to the national economy. To understand the recent complexity of banking in the wake of rising terrorism and fundamentalism. To investigate the different functions performed by different departments. To find out the challenges associated with the activities concerned with remittance department. To review the management system of the bank. To have an idea about profit and loss position of Sonali Bank Ltd.
To observe the working environment of remittance department. To understand the real management situation and try to recommend for improving existing problems. The development process of a country largely depends upon its economic activities. Banking is a powerful medium among other spheres of modern socio-economic activities for bringing about socio-economic changes in a developing country like Bangladesh. Three different sectors like Agriculture, commerce, and industry provide the bulk of a country’s wealth. The nourishment of these three is only possible through an adequate banking facility. The banking service facilitates these three to be integrated in a concerted way. For a rapid economic growth a fully developed banking system can provide the necessary boost. The whole economy of a country is linked up with its banking system. With the passage of time the functions of the bank has got a multi-dimensional configuration. All the functions of a modern bank, lending is by far the most important. They provide both short-term and long-term credit. The customers come from all walks of life, from a small business a multi-national corporation having its business activities all around the world. The banks have to satisfy the requirements of different customers belonging to different social groups. The banking business has, therefore, become complex and requires specialized skills. They function as catalytic agent for bringing about economic, industrial and agricultural growth and prosperity of the country. The banking can, therefore, be conceived as “a sector of Economy on the one hand and as a lubricant for the whole economy on the other”. As a result different types of banks have come into existence to suit the specific requirements. Regardless of the numbers of banks and nature of their functions and activities, a central bank exists to regulate the activities of other banks. All the commercial private and/or nationalized, and specialized banks perform service related activities within the jurisdiction of the central bank. In our country, Bangladesh the role of the central bank is entitled to be executed by Bangladesh Bank. As different banks are in the field to satisfy the customers of different requirement, we can classify the banks using a diagram that is replicated in the following page. Some words used in abbreviated form in the following diagram require explanation. BASIC = Bank of Small Industries and Commerce, Bangladesh Ltd.
(a) SACP-Special Agriculture Credit Program: It starts in 1977. This credit program is especially for Agriculture crops. Tk.100 crore was sanctioned for the program last year. Its main objective is to finance in the rural economy. (b) Pond fisheries: Its main objective is to encourage the fisheries sector and thus to solve the unemployment problem. Duration of the credit is three years. This credit program is for agro based or non agro based product. (d) Special Investment Scheme: This credit program was started in 1993. Its main objective is to reduce the import of milk. Tk.400-500 crore was required to import milk. But after starting the program the amount go down in Tk. 200 crore. (e) Social a forestation credit program: Its main objective is to greening the country involving the rural people and thus to improve the ecological condition of the country along with the improvement of the economic condition of the people. (f) Agri farm credit program: Its main objective is to build up a large comprehensive farm and thus to encourage the agriculture sector of the country and to solve the unemployment problem. Sanirvar: This credit program started in the village level named “Dheki Rin”.But the program failed due to corruption. Loan sanctioned in the member level. Due to the failure of BSB and BSRS Sonali Bank Ltd. started to play role for industrialization. In 1977 SBL started different small loan projects. SBL started financing the small industries and started to get success. After getting the SBL started financing all the small or big industries. But with the passage of time credit recovery is getting worsening. At present defaulter case is 32-40% and the main reason is political influence. It is a great advantage for SBL staff getting housing loan at a lower interest rate. It is now only 5%. The staffs repay the loans with interest at a monthly installment. For this cheque book of each borrower is maintained. A certain installment is cut from the salary each month. To provide all kind types of banking service at the doorsteps of the people. To establish a countrywide information network system to facilitate monitoring and to improve the quality of service of the bank. To provide general advances in different sectors to up-gearing the economic activities. To promote the economic development of the country as well as increase per capital income. To provide term loan to establish new industries to create opportunities for new employment. To ensure qualified customer service Sonali Bank has started in addition to computerization corporate client service and one stop service. To facilitate the foreign exchange activities Sonali Bank has launched SWIFT (Society for Worldwide Inter bank Finance and Telecommunication) system in its 12 branches. The bank has launched Website, Reuter service, Internet service, and Ready cash service. The bank has taken a plan to launch shared ATM system in various important places. Already, it has given work order for this. Remittance Management System is a customized process of sonali Bank Ltd. This is totally bank’s own system where foreign remittances were processed. Basically bank collects the remittance from the 41 exchange houses of different foreign countries. These exchange houses collect money from the customers and then send information about the customers to the bank. There are two processes for sending the information to the bank. After receiving this data bank process this data with the help of customized software which is prepared for process this data. This software is called Remittance Management System (RMS) software. Some high quality, energetic, IT specialist and dynamic young group are engage to ensure the faster and swift service to the customers. PON (Payment Order No) No. The bank has installed RMS at Wage Earner’s Corporate Branch (WECB), Dhaka. The incoming remittances are downloaded and processed at WECB using RMS. RMS captures various structured remittances from various exchange company and converts it into a unique structure and imposes a security. After capturing the remittances RMS receives an administrative password, a part-1 test key holder password, a part-2 test key holder password and two signatures activation password daily. In RMS there are 20 (Twenty) parameterized signature. We can change the signatory dynamically per day. RMS has automated secured test key module. So RMS generates test key automatically for every amount. Then we accumulate the TRA data of various exchange company and impose three types of security and validate using RMS Data Center for live outlets. The RMS module of outlets receives incoming remittance data packet & validate it. After validation the TRA prints automatically with two signatures and a test number. An authorized signatory of outlets sign on TRA as third signature and distribute it. The TRA of distance location is distributed over phone initially and put a seal on TRA as “ credit over phone”. The outlet collects the credit date of TRA from branches and sends a feedback file to WECB. This feedback is used for Reconciliation and overseas exchange company/Bank. Remittance means transfer of money from one to another. Bank provides this facility to their customer as a part of essential services provided to them. The transfer of money can take place either within the country or from one country to another. The remittance of freely convertible foreign currencies which we are receiving from abroad against which the Authorized Dealers making payment in local currency to the beneficiaries may be termed as Foreign Inward Remittance. The transfer of money can take place either within the country or from one country to another. Foreign remittance, in simple terms, means money remitted in foreign currency. More precisely, it is termed as remittances in foreign currency that are received in & made out abroad. Conceptual Issues International remittances are defined as the portion of migrant workers’ earnings sent back from the country of employment to the country of origin (ILO, 2000). Remittance can also be sent in kind. Transfers that take place in kind is quite difficult to measure. Remittances can be individual and it can also be collective. When individuals send remittance to his/her household or kith and kin that can be termed as individual remittance. When a group of migrants, their associations or professional bodies mobilize resource together and send for collective or community program that can be termed as collective remittance. Individual remittances are mostly geared towards the family whereas collective remittances are generally used for community development. When transfer of money occurs from any foreign country to the home country it is called foreign remittance. The economy of Bangladesh is mainly depended on this sector. A lot of people staying outside the country send money to their relatives and family. Both the receiver and sender want this money to be transferred. safely and rapidly. Bank provides these services to them in a secured way. The remittance of freely convertible foreign currencies which we are receiving from abroad against which the Authorized Dealers making payment in local currency to the beneficiaries may be termed as Foreign Inward Remittance. The remittances in foreign currency which are being made from our country to abroad is known as foreign outward remittance. To meet Travel Expenses/Medical Expenses/Educational Expenses etc. Sonali Bank has arrangement with some foreign bank and transfer agencies in various countries. When transfer is made from those countries and through any of those financial institutions, they transfer it directly to the Sonali Bank. This transfer is made through online. Generally Sonali Bank Wage Earners Branch receives all these remittance and then sends it to the respective branches of the bank. This is transferred by filling up a TTPO (Telegraphic Transfer Pay Order) form or FTT (Foreign Telegraphic Transfer) form. The remitter can send money through any financial institution which has branches in both countries. In this case, the bank in Bangladesh receives the amount from its foreign branches and then transfers it to the bank where the client wishes to draw the money. Here the bank needs to fill up a C’ form if the amount of money is $2,000 or more. It is done for the declaration for remittance received from foreign country in the amount of $2,000 or more. When money is transferred through one place to another place within the country, it is called Local Remittance. Sonali Bank has highest number of branches all over the country and offers various kinds of remittance facilities to the public. The following are the mode of Inward/Outward Remittances. i) TT = Telegraphic Transfer. ii) MT = Mail Transfer. iii) FD = Foreign Drafts. iv) PO = Payment Order. v) TC = Travelers Cheque. Payment Order is an instrument that is used to remit fund within a local area i.e. within the same clearing house area. For example, if we want to remit fund from one place of Dhaka to another place, we generally use payment order. It is an instrument that is drawn on one banker office to another or other banker’s branch to pay certain sum of money to the named person. It is generally used to remit fund from one corner of the country to another. For example,, if we want to remit fund from Dhaka to Khulna we use DD. DD is very popular instrument for remitting money from one corner of the country to another. In case of Demand Draft both the payer and payee need to have accounts. But there is no certain rule for pay order. PU is used in the same clearing area; DD is used for all kinds. DD can not be done in the same clearing area. DD is drawn on a certain bank office. But there is no certain rule for pay order(PO). Some times the remitter of the fund wants the money to be available to the receiver’s account immediately. In that case bankers arrange to remit the fund telegraphically. Here the remitter bears the additional charge for telex/telephone. It is an instrument that is drawn by one banker office on another or other banker’s branch to pay certain sum of money to the named person. This instrument is not given to the holder but the bank carries it and a message is sent to the particular branch. It is generally used to remit fund from one corner of the country to another. Credit beneficiary Account within 8-24 Hours. Additional instrument copy prints with “Care Duplicate”. A remitter abroad simply has to approach a bank branch there with certain amount to be deposited beneficiary in Bangladesh either in foreign currency or in equivalent Taka currency. The Branch so approached abroad usually should have agency arrangement with the paying banks in Bangladesh. However, in the absence of any such agency arrangement, remittance may also be made by transferring cover value of the remittance to the paying bank’s account abroad by the remitting bank. Bangladesh is always in a scarcity of foreign exchange and foreign exchange business is restricted and controlled by the Central Bank of the country. For this reason Bangladesh Bank’s prior permission is required for any remittance to be made to outside the country. Bangladesh Bank provides permission/approval for outward remittances to the applicants who are to lodge an application for the purpose on the following prescribed forms with an Authorized Dealer who forwarded the same to Bangladesh Bank for approval. These are some of the major countries of destination. Saudi Arabia alone accounts for nearly one-half of the total number of workers who migrated from Bangladesh. Labor market of Bangladeshi workers is not static. During the 1970s Saudi Arabia, Iraq, Iran and Libya were some of the major destination countries. While the position of Saudi Arabia remains at the top, Malaysia and UAE became important receivers. In mid-1990s, Malaysia became the second largest employer of Bangladeshi workers. However, since the financial crisis of 1997, Bangladeshis migrating to Malaysia dropped drastically. Now UAE has taken over its place. Over the past 25 years labor migration from Bangladesh has registered a steady increase. From 1990 onwards on an average 3, 25,000 Bangladeshis are migrating on short-term employment, mostly to 13 countries. In the past the bulk of the migrants consisted of professional and skilled labor. However, the recent trend is more towards semi- and unskilled labor migration. Due to increase in the flow of unskilled and semi- skilled labor, remittance is increasing at a much lower rate than the labor flow. Remittance is crucial for Bangladesh’s economy. It constitutes almost one-third of the foreign exchange earning. About 25 percent of remittance senders were students when they went abroad and another 25 percent were living off their own land. A large segment of them were working as construction laborers overseas, another group worked as agricultural laborers. UAE, Saudi Arabia and Singapore constituted the most of important destinations of these migrants. One survey comments that if the migrant workers’ total income abroad and the present family income from other sources is combined and then compared with the pre- migration family income, it registers an increase in total income by 119 percent. On an average, the interviewee households annually received about Tk.72,800 as remittance. This means that a typical migrant remits 55.65 percent of his income. Remittance constitutes 51.12% of the total income of these families. Transfer of remittances takes place through different methods. 46% of the total volume of remittance has been channeled through official sources, around 40% through hundi, 4.61% through friends and relatives, and about 8 percent of the total was hand carried by migrant workers themselves when they visited. Labor migration plays a vital role in the economy of Bangladesh. Bangladesh has a very narrow export base. Readymade garments, frozen fish, jute, leather and tea are the five groups of items that account for four-fifths of its export earnings. Currently, garments manufacturing is treated as the highest foreign exchange earning sector of the country (US $ 4.583 billion in 2003). However, if the cost of import of raw material is adjusted, then the net earning from migrant workers’ remittances is higher than that of the garments sector. In 2003, net export earning from RMG should be between US$2.29-2.52 billion, whereas the earning from remittance is net US$3.063 billion. In fact, since the 1980s, contrary to the popular belief, remittances sent by the migrants played a much greater role in sustaining the economy of Bangladesh than the garments sector.8 For the last two decades, remittances have been at levels of around 35% of export earnings, making it the single largest source of foreign currency earner for the country. This has been used in financing the import of capital goods and raw materials for industrial development. In the year 1998-99, 22 percent of the official import bill was financed by remittances (Afsar, 2000; Murshed, 2000 and Khan, 2003). The steady flow of remittances has resolved the foreign exchange constraints, improved the balance of payments, and helped increase the supply of national savings (Quibria 1986). Remittances also constituted a very important source of the country’s development budget. In certain years in the 1990s remittances’ contribution rose to more than 50 percent of the country’s development budget. Government of Bangladesh treats Foreign aid (concessional loan and grants) as an important resource base of the country. However, remittances that Bangladesh received last year was twice that of foreign aid. Remittances have played a major role in reducing the extent of the country’s dependence on foreign aid. The contribution of remittance to GDP has also grown from a meager 1 percent in 1977-1978 to 5.2 percent in 1982-83. During the 1990s the ratio hovered around 4 percent. However if one takes into account the unofficial flow of remittances, its contribution to GDP would certainly be much higher. Murshed (2000) finds that an increase in remittance by Taka 1 would result in an increase in national income by Tk 3.33. Following the expiry of multi-fiber agreement (MFA), Bangladesh will face steep competition in export of RMG. The country will cease to enjoy any special quota. It is apprehended that Bangladesh’s RMG export will decline sharply. This will result in loss of job of many workers and shortfall in foreign exchange earning. Potential of retaining employment and export earning through export of frozen fish, jute, leather and tea seems rather bleak. It is in this context labour migration has become key sector for earning foreign exchange and creating opportunities for employment. Therefore, the importance of migrant remittance to the economy of Bangladesh can hardly be over emphasized. Ministry of Finance (MoF) is the prime policy making body regarding banking and remittance. Macro-economic policies that affect exchange rate, monetary and fiscal mechanisms, foreign exchange reserve etc. are regulated by this ministry. It also generates analyses, interprets and distributes data on inflow of remittance. Nationalized Commercial Banks (NCBs) of Bangladesh make direct banking facilities available at the doorsteps of Bangladeshi emigrants especially in those countries where a large number of Bangladeshis are employed. Five NCBs are deeply involved in remittance transfer. These are Sonali Bank, Janata Bank, Agrani Bank, Rupali Bank Ltd. and Bangladesh Krishi Bank (BKB). Among the NCBs, BKB is solely targeted towards agricultural development in rural areas. Within Bangladesh these five NCBs have 2945 branches. Through them they can disburse remittances even in distant areas. Besides their own branches, NCBs have opened exchange houses in joint collaboration with different banks and financial institutions in different countries of the world. Private Commercial Banks (PCBs) are also involved in remittance transfer. Of the PCBs, Islami Bank of Bangladesh Ltd. has been found to be most proactive in the area of migrants’ remittance. National Bank, International Finance and Investment Corporation (IFIC), Prime Bank and Uttara Bank are other private banks involved in remittance transfer. Most of their activities are in the Middle East. Saudi Arabia is the major working area of Islami Bank along with Qatar, Bahrain and UAE. National Bank is operating in Oman, Kuwait, UAE, Qatar, Bahrain and Saudi Arabia. IFIC has curved out a major niche in Bangladeshi community in Oman and has its largest share with 41% of the market. It also has branches and exchange offices in Nepal and some other Middle Eastern countries. Uttara Bank runs exchange house in Qatar in collaboration with a local financial institution. Corresponding Relationships In almost all countries of the world, both NCBs and PCBs have corresponding relationships with banks through which Bangladeshi migrants may easily send their money to their beneficiaries’ accounts with any branch of any bank in Bangladesh. I have found out some points by screening the whole study, which are expressed as major findings. The conversations with the Sonali bank Ltd officials were very significant for the findings. As a commercial bank, SBL still follows the traditional banking. This organization still concentrates on production oriented approach but for the present era of Marketing. The large distribution channel and the inefficiency of the employees do not permit the proper marketing orientation in Banking. There is a training institution and a human resource division of SBL to run the activities of human resources. The communication of SBL is open and free. SBL uses notice board, magazine, newsletters, the suggestion programs etc as a method of communication. It uses pay, financial incentives, flexible working hours, work sharing, promotions, giving responsibilities, autonomy and decision as a method of motivating employees. It provides compensation according to the government pay scale. It has no any procedure to determine salaries and wages. There is no provision for overtime in SBL. It uses negotiation procedure to grievance handling. It has a better labor management relationship. There is no specific job analysis for the evaluation of the position in the SBL. SBL describes the duties and responsibilities of the department and the department describes the duties and responsibilities of the sections of the department. Sometimes inefficient allocations of resources have created a huge amount of had debt. Sometimes pressure groups are involved sanctioning loan. Problems of software should be managed soon. Banking policies are generally made at the Ministry of Finance and the policies are scrutinized and implemented by the Bangladesh Bank. Later, the Bangladesh bank enforces these rules and regulation, interest rates, loan disbursement etc. important banking factors for other commercials banks and financial organizations. In many cases, the faulty decision-making and policymaking costs commercial banks dearly. So, before making any sort of drastic decision regarding policymaking the government should at least discuss with the top management of the commercial banks. Sonali bank Ltd faces severe lack in strong management policy. Most of the top management are influenced by the government bodies like Bangladesh bank and Ministries. They are not allowed to work freely rather depend heavily on government organizations as such. So in most cases independent decisions do not come from bank officials. There are more than 1,000 branches of Sonali Bank all over Bangladesh and outside Bangladesh. But all the branches are not balanced from employment point of view. Some branches of Regional/Principal offices have over employment while some faces the problem of under employment. The balance of the personnel working in each branch has to be set properly depending on the volume of work. This is basically due to lack of manpower against huge amount of work the bank usually deals with. Sonali bank does what a private bank does, apart from that it also works as the treasury service of the government, utility services, passport services, foreign currency service and virtually all the services that can be done by a bank is done by Sonali Bank. Considering huge amount of work some branches notoriously lag enough manpower against it. It is not the efficiency of the workers that is lagging, but it is the huge amount of work to be done is not met by mere manpower. We have already considered data where we have found the recovery of Sonali Bank’s credit is very poor. There are many reasons behind it. The culture of loan default has to be overcome taking appropriate measures. Sonali bank Ltd has to follow the above suggestive measures, so that its performance, deposit disbursement, recovery, investors, importer, goodwill etc. will be increased. Although Sonali Bank Ltd has taken the facility of using computers in maintaining cash and other sections but still it has not taken the full advantage of the modern day wonder of full fledged computer facilities. Most of the private banks are operating 24 hour basis online banking – the sector still ignored by Sonali Bank. All the branches do not maintain their ledgers using computers yet. Money transfer in different modes, wage earners and foreign exchange etc. has not still taken up by the computers till now. To deliver faster services to the customer’s convenience, Sonali Bank Ltd should provide more personnel to customers. Proper communication system and maintenance of files & machineries like phone, computer, fax, and photocopier need to be ensured. To ensure error free faster services, the bank should be fully computerized. Effective strategies must be undertaken against defaulters. Office should be fully decorated to attract clients to take its services. More employees are to recruit. For the better service, training is must and according to the skill and education background of employee needs to be positioned. The Bank should absolutely maintain on its own rules and procedures. The Bank should introduce reward system for good borrowers as well as punishment for bad borrowers. The Bank should apply modernized Marketing Information System. The Bank should act without any kind of political influence. Largest commercial bank in Bangladesh. Widely recognized and strong brand name. Strong liquidity and financial condition. Strong networks all over in Bangladesh. Huge amount of bad/debt loan. Service is not up to the mark. Online banking is not strong. Weak branch controlling and monitoring system. Increasing demand of customer finance. Enormous opportunity in foreign remittance section. High standard Commercial/Foreign bank as well as private bank. Illegal interference of CBA in banking activities. Highly qualified and experienced bankers leave the bank a very high percentage. Cannot take proper action against bad debtor due to political interference. Increasing percentage of shifting customer loyalty. Low Interest rate compare to private /Foreign banks. The Banking arena in recent time is one of the most competitive business fields in Bangladesh. As Bangladesh is a developing country, a strong banking sector can change the socio economic structure of the country. So we can say, the whole economy of the country in linked up with its banking system. There are 54 banks in Bangladesh in which 38 are indigenous commercial Banks. 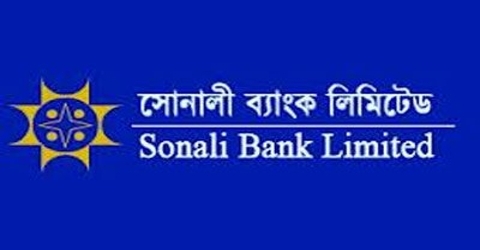 Sonali Bank ltd is the largest commercial Bank of Bangladesh. This bank performs hundreds of important activities both for the public and for the government as a whole. It has an outstanding bearing to thrive our business sector. It has strong performance on General Banking, Loans & Advances, Industrial credit and foreign Exchange. I had the privilege to learn many things about the remittance management system from the SHILPA BHABAN Corporate Branch through my active involvement in this branch.